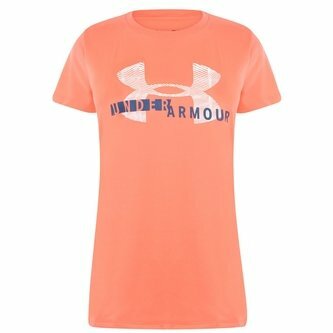 Train in comfort when you pull on this Under Armour UA Tech Ladies Graphic S/S Training T-Shirt in After Burn, White and Static Blue. This t-shirt is perfect for the gym, training or simply out and about in the sunshine. It has been crafted using UA Tech fabric as it wicks sweat away from the body and then, in turn, dries really fast to prevent that sticky feeling. The fabric is quick-drying, ultra-soft whilst feeling more natural than ever. This tee uses a 4-way stretch construction to allow you to move better in all directions whilst the fuller cut provides complete comfort.